I know I'm late to the part for Outlander. When it first came out I was busting my booty on Geek, so I just didn't have time to watch a show that I knew had tons of knitting that I would want to recreate! 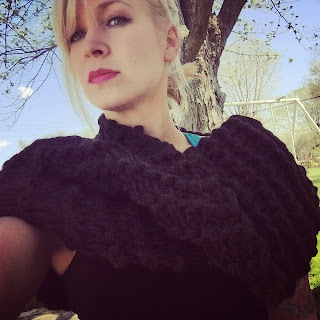 That being said, I know there are lots of Outlander Cowls floating around, but I thought I would add my version into the pile regardless! It took me a while to get the stitch definition that I wanted. I started with size 11 needles and ended up going to US 36! I also tried several different yarns when swatching, but fell in love with the way Knit Picks, The Big Cozy feels and the way it drapes. I also struggled with whether or not the cowl was twisted. I tried it both ways, but came to the conclusion that it's not. If you disagree, feel free to twist your cowl! 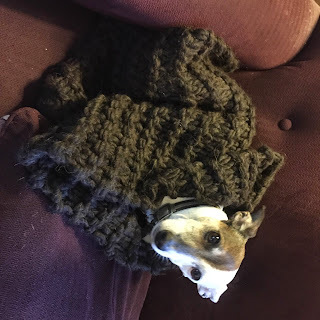 I also really like doing a live cast on, since it hides any seaming. But feel free to cast on normally and seam at the end if you're not into the live cast on! Note: If you leave the super warm and soft cowl around a dog named Harvie, she will burrow in it and make it her own. 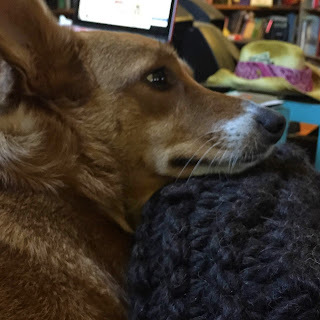 While a Corgi named Willie will use it as a chin rest. Scrap yarn for cast on. If using scrap yarn, tie scrap yarn and working yarn in a knot, about 3” from end of yarn. Hold both pieces of yarn in left hand, with working needle in right hand. Scrap yarn should be on top, working yarn on bottom. Bring working needle in front of scrap yarn, and behind working yarn, putting it on your needle. Repeat until all stitches are on your working needle. Knit until pieces measures about 36” (or desired height) and place live cast onto empty needle, then seam together using Kitchener stitch. Last Saturday the performance team at Asa Bela got to debut something we've been working on for a long time. We were asked to do the halftime show for Bleeding Heartland Roller Derby vs. Ann Arbor Derby Dames. I worked my booty off (actually literally. 10lbs and 10") for a month to get this down. Ever done lyra? Hard right? Now put skates on and try it! We had so much fun, and my lyra partner Sue was just amazing and dedicated tons of time to getting all of this right! (And she never got mad when I kicked her). Check out the video that Chris Rall made! CLICK ME! Now, normally I would really care that I took a picture after multiple workouts (Insanity, Elliptical and Lyra and Silks IN SKATES) and that my make up was streaky, my hair a mess, etc. But I don't care at all. 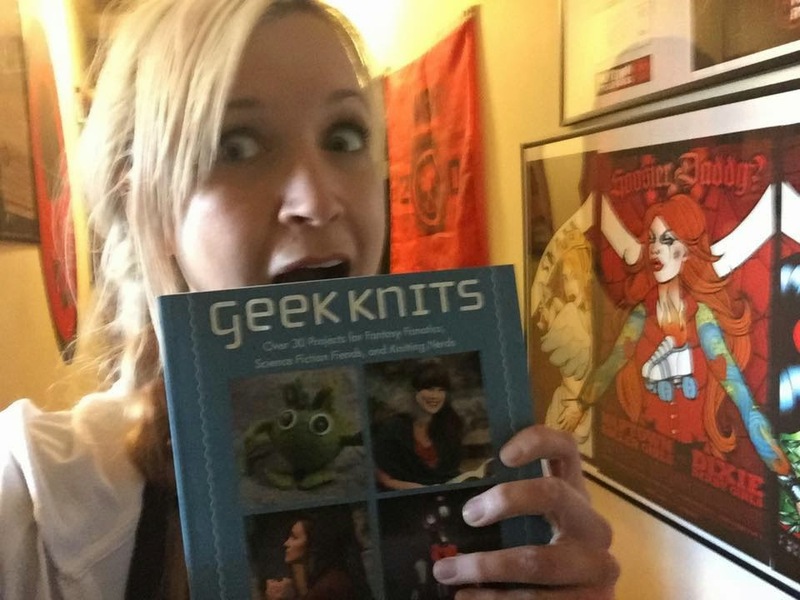 I'm way too excited over having an actual, physical copy of Geek Knits in my hands. This is really real people. This book is happening. The publisher has printed it. I am now alternating between wanting to tell EVERYONE and wanting to hide under my blankets for the next 6 months until it's all over. The anticipation is a mix of "Oh god I hope all the tech edits are right and all the test knits were right and there aren't any mistakes" and "Oh god I hope everyone just LIKES the dang thing". Right now I'm trying to just relax and feel the joy that something pretty crazy was accomplished. It's something I loved doing and I hope that everyone is going to love reading. As a reminder, click the "Books" tab up top to pre-order. Or tell your library you hope they stock it. If you're totally disinterested in Geek Knits, you may want to put this blog on mute for a few months, because it's going to be all Geek for a while!